This past week's weather has not been kindly to skiers and snowboarders. But today was the exception. The temperatures dropped last night and today, so there was fresh snow on the slopes and partial sunshine. 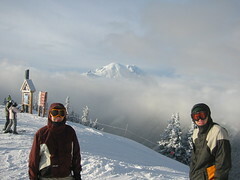 My sons (-Bjorn, due relational priorities) and I made the trip up to Crystal Mountain and had a blast. There were a lot of people that had the same idea, so we had to fight the crowds at the lifts. Tonight we are driving to Lynden to be with family for a few days.